1. Be sure that your summer camp is following local codes and laws regarding activities, snacks, and how the day is spent. You do not want your camp shut down in the middle of the week because you were providing snacks. 2. Review your camp in detail with your insurance provider. Make they provide Workman’s Compensation and that every activity is previewed. You may even have to name your city or town in your policy. While most martial arts schools and fitness centers dread the dog days of summer, others are making the summer months their best months of the year. What’s the difference? Rather than focus on the potential drop off of business due to vacations and competing sports, the successful schools take full advantage of the opportunity that summer really offers. Parents have to put their kids somewhere safe during the day. Even many stay-at-home parents want their kids out of the house and involved with something fun and different during the summer. Depending on where you live, summer breaks range from 10 – 12 weeks. Many families take vacations or go visit relatives for a portion of the summer. This dictates that you build your summer camp programming and tuition around one-week segments. You can combine weeks into packages such as a six or eight-week package for 10% off of the one week price. If you regular summer camp week is $149, offer a package of six weeks for $799 for about a 10% discount. You want to be careful with discounts though. The kids have to be somewhere. You will probably get the money anyway, but it’s also nice to have cash up front. Make sure that your agreement stats that you do not give refunds, only credits and make that clear to the parents. It’s a bit of a risk-reward ratio for both of you, so be upfront about it. Call local daycares to see what they are charging and their terms. Do they include field trips? Do you have to pay for missed weeks or is there credit? Get to know what market is like in your area. That doesn’t mean you undercut them. 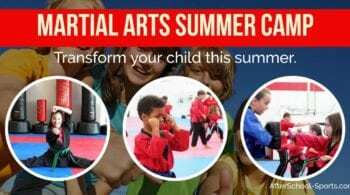 Your summer camp includes martial arts training, uniforms, belt exams, and safety equipment. The local daycares will not usually have those additional revenue streams so you can undercut their tuition because you will make it up on uniforms, exams, equipment, and snacks. It’s a proven success to provide two field trips per week at no additional charge. This requires planning and an excellent insurance plan, but it can really make a difference to your kids’ enjoyment of your summer camp. However, it’s equally important that you maintain martial arts discipline on site and while traveling to and from the field trip. That means children are quiet on the bus. They line up when you tell them to. They say “please” and “thank you” and show respect when addressing staff at the facility. Even though you’re teaching martial arts and self-defense at your camp, you still want the kids to enjoy swimming, soccer, tennis and other sports and activities that add up to a memorable experience that they want to return to next year. Running a summer camp can be exhausting. That’s why you have to choose and schedule your staff wisely. Summer camp is full-time and you will need to have enough staff to overlap the hours into the evening or be prepared to work 65 hour weeks. Make sure your staff are not on their cellphones or texting when at your school working and especially on field trips. They need to pay attention to the students at all times. There are three important components to successfully staffing your summer camp. 1. Run background checks on everyone. 2. Get comprehensive insurance that includes workman’s compensation. The odds of an accident happening are much higher when running a summer camp than your regular evening classes, so be smart and protect yourself. 3. Stagger the day. Let the person who opens the school at 7 am go home after lunch while the person who arrives at 10 pm can stay until the end of the day. Structure two classes per day each day with one class at 10:00 a.m. and the other to coincide with your after-school program from 4:00 pm to 5:00 pm. On field trip days, you may only want to do one class for a total of 8 classes instead of 10. Kids start to arrive at 7:30 – 8 am. They can spend that time in quiet activities until the program officially starts at 9:00 with a morning snack. They will have to bring a snack or purchase a snack. It’s against code in most areas to provide snacks. Kids help to clean up. Board games and a short movie or TV show will fill the time until the first martial arts class of the day. This is a martial arts class just like your evening classes. Downtime as kids watch a G-rated movie or play board games. Maybe a field trip or a guest comes in to teach and speak with the children. Local police and firefighters are great options. Amateur magicians looking for stage time can work as well. Get creative. Second martial arts class of the day. Clean up and prepare to go home. Pick-up is between 5:00 and 6:00 with a late fee for anyone after 6:15 of $3.00 for every 15-minute block of time. During the summer, you will have late drop-offs and early pick-ups, because of the nature of summer camp.